Toss over salad or with a side of rice and your favorite veggie or serve over some rice vermicilli. 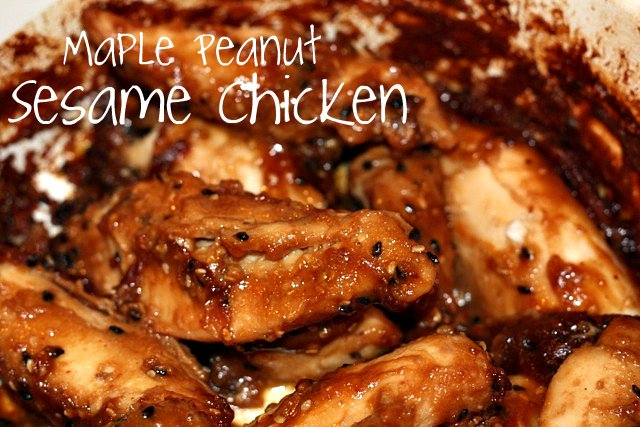 In medium casserole dish, add peanut butter, sesame oil, soy sauce, sesame seeds, ginger and maple syrup whisking to blend. Add chicken and toss to coat with mixture. Cover and refrigerate for 30 minutes-several hours. Keep chicken in 'marinade' and place casserole uncovered in oven. Bake at 350 degrees Fahrenheit for 30 minutes or until chicken is cooked through. Serve over rice vermicelli noodles or baby salad greens. One Pan Mexican Chicken & Rice Fiesta! In large frypan over medium heat, brown up your meat / chicken, until no longer pink. Add in taco seasoning, diced tomatoes with juice, corn (if using), rice and chicken broth or water. Raise heat to high to bring mixture to a boil, then reduce to simmer for 20 minutes, place a lid on your pan. Stir half way through cooking time. Add cheese evenly over top of meat mixture, replace cover for 2-3 minutes or until cheese melts. Add various toppings as desired. P.s. I would also sneak in some finely diced carrot to add in another vege too. Spring is officially here and the warmer weather means we have some wonderful spring lamb readily available. I LOVE my lamb and these BBQ (forequarter) Lamb Chops with this super tasty sauce, would just go down so well with a fresh salad or if you prefer some roasted vegetables. This one is again LOW FODMAP, for those with sensitive bellies, but I promise that its NOT LOW FLAVOUR! I love picking up a lamb chop & eating it with my fingers and can't wait to get some feedback from you on if you loved this one as much as we do! Season the lamb chops with salt and pepper. Heat the oil in a large frypan over medium-high heat. Sear the lamb chops until golden brown and medium rare, about 3 - 5 minutes each side, working in batches if needed. When chops are done, transfer to a serving platter and cover with aluminum foil to keep warm. Reduce heat to medium-low and de-glaze the pan by carefully pouring in the broth and wine, scraping up any browned bits. Simmer until broth and wine have reduced by half. Stir in the Dijon and lemon juice and simmer one minute more. Add the butter and stir until melted. Remove from heat and stir in the chives and rosemary. Season to taste with salt and pepper.